As some of you may know I was lucky enough to have the opportunity to go and visit my lovely friend Lucy in Singapore earlier this year. She moved out there to work a year ago (lucky thing!) so me & a couple of friends went out to stay for a couple of weeks, with a cheeky trip to Thailand thrown in as a bonus. 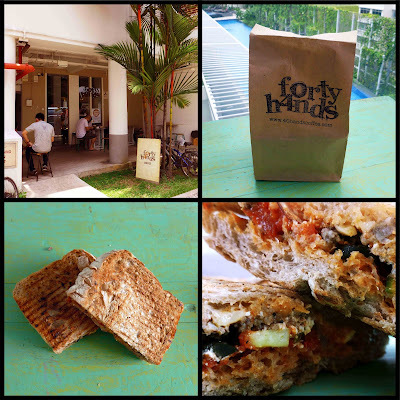 Whilst we were there we discovered something amazing... something which rivalled the view from the pool at the top of Marina Bay Sands, the gorgeous tree lined streets & the dim sum... and it came in the form of a very special sandwich. How I wish I didn't love food quite so much... ha! Anyway, I knew I wouldn't be able to do it justice, so as a very special treat today's blog comes all the way from Asia! It's the little things in life that can make our weekend that little bit more humble and warming. For me, it's a stroll to my local barista coffee house, 'Forty Hands'. Located in the quaint, nostalgic residential district, Tiong Bahru. Forty Hands is Singapore's best kept secret. Now don't me wrong the coffee is wonderful, but it's not hard to find great coffee in Singapore.... It is in fact the sandwiches that make Forty Hands more than worth the visit. And so I must tell you about the delight that is the Grilled Mediterranean Lamb Sandwich. Served in a large chunk of toasted freshly baked granary bread, the melted cheese, herby lamb, olives, sun dried tomatoes and onions create a to-die-for combination of delicious Mediterranean flavours. I can honestly say nothing beats the tastiness of this sandwich. It's the perfect hangover cure, pick me up or just general hunger filler!